Kurdish Conference in EU Parliament: We call upon trade unions, social and academic organisations, non-governmental organisations to continue their support for a peaceful and democratic solution to the Kurdish question. 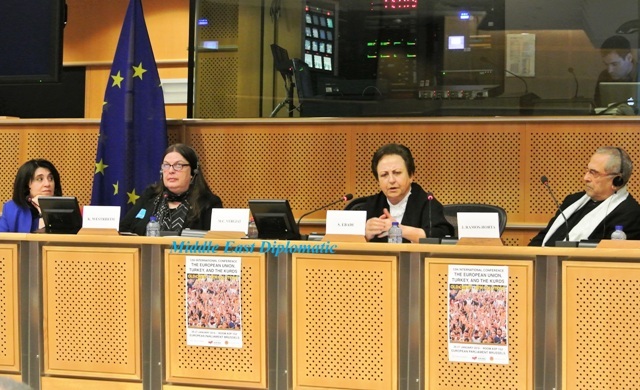 Brussels, 1 February 2016 - Middle East Diplomatic (MED) -After two days conference in the European Parliament, the final resolution of 12th international conference on the European Union, Turkey, the Middle East and the Kurds call upon trade unions, social and academic organisations, non-governmental organisations to continue to express their support for a peaceful and democratic solution to the Kurdish question. The conferance underlined that throughout the year in many regions across the world armed conflicts and occupations have caused significant human rights infringements. Radical extremist Islamic organisations such as ISIS and Al-Qaeda have added a new dimension to assaults on the right to life in attacks carried out in the Middle East, Africa and Europe. The panel speakers pointed out that the attacks carried out in Kurdish city Diyarbakir, Suruc and the Turkesy capital Ankara in their increasing ferocity outraged humanity. After the Turkish general elections June 2015 in which a peaceful and democratic solution to the Kurdish question was shelved, it was again the right to life that was most readily infringed upon when hostilities between the Turkish state and the Kurdistan Workers Party PKK flared up. It was especially when towns and residential areas were besieged while illegal curfews were implemented by the Turkish state that the young, the elderly, women and children were deprived of their right to life. After the Turkish general elections on June 7, a peaceful solution to the most important component of Turkey’s human rights and democracy problem was unilaterally abandoned by the Turkish Government and destroyed the achievements of the last years not only concerning the Kurdish question but also economic and politic acquisitions, a new repression approach that resurrected the human rights abuses of the 90s was once again put in place. It is especially worrisome that the allegedly illegally implemented curfews in Kurdish towns have led to the affected population being deprived of basic supplies such as water, food, electricity and medical supplies; while at the same time; many civilians have been purposefully targeted and killed. The economic activities and social life of the towns and cities where the curfews have been unremittingly imposed have come to a virtual standstill. The mayors and elected officials of these towns and cities are being imprisoned or forcefully unseated. These measures show a complete disregard of the democratic will of the people. • The besiegement of cities and curfews must be terminated immediately. • Turkish forces and the PKK must act in accordance with international law, and must not target civilians and residential areas. • Those that were forced to flee must be allowed to return, and must be compensated for their loss. • An independent commission must be formed to research the human rights abuses committed during this time; those responsible should be held accountable. • Both sides must stop their attacks and commit to a ceasefire. The party who does not adhere to this ceasefire should be condemned. • All sides must return to the negotiating table under the previously drawn up framework announced on the 28th of February, 2015 (named the Dolmabahce Agreement). During these negotiations there should be third party monitoring. • The solitary confinement of Mr. Abdullah Ocalan that has been put in place since the 5th of April, 2015, must be terminated. Mr. Ocalan’s health and security must be guaranteed in order for him to effectively take part in the negotiation process. 3.Turkey must cease its support for Jihadist groups in Syria and must commit to being an effective member of the international coalition against ISIS. It must abandon its anti-Kurd policies in Syria, and must work with the Kurds and the democratic opposition in Syria towards a political solution. 4.Turkey and the EU must approach the issue of the refugees of this region as a humanitarian issue, and must not use the refugee crisis as a bargaining chip for their own short term interests. In responding to the situation of the refugees Turkey must uphold the Geneva Convention. 5.Freedom of thought and expression must be guaranteed, the suppression of the media must be abandoned and all imprisoned civilians with among them journalists, lawyers, local administrators, mayors, activists, students must be freed. 6.Anti-democratic suppression of the opposition must come to an end. The lynching campaign against the academic world must end immediately. • The EU must not confine itself to mere calls for a ceasefire, but must also be proactive in implementing a roadmap for a peaceful solution. In order for a peaceful solution to become more feasible, the PKK, as a party to the solution, must be taken out of the terrorist organisations list. Violence against civilians must be condemned. • The EU must not stand by and merely watch Turkey’s repressive, extra-judicial and anti-democratic practises. • The EU accession negotiations should only continue if Turkey returns to negotiating table. • The issue of the Kurdish question should be addressed as a political issue and not as an issue of terrorism. 9.The members of the International Coalition against ISIS, primarily the USA, must stand against the anti-Kurdish policies of Turkey and must take a proactive stance in the quest for a peaceful solution to the Kurdish question. 10.The international community, the EU, the USA and other Western countries should recognize the important role of Kurds for contentment and stability in the region. 11.PYD should be a part of the Geneva II Conference on Syria. 12. We call upon trade unions, social and academic organisations, non-governmental organisations to continue to express their support for a peaceful and democratic solution to the Kurdish question. 13.A humanitarian corridor at the border between Turkey and Syria should be established.